I just bought a 30 day premium plan but only World of Tanks and World of Warplanes updated while World of Warships failed to update. Any Ideas? I tried to send a support ticket but the filing page would not accept the time entered so no good there. WOWS premium pays 65% XP rather than the WOT/WOWP 50%. I am sure it's still there but doesnt see it as WOWS premium time. WOWS has a completely separate economy and premium time. WOWP and WOT share gold, XP and premium time. Have you tried to log off from the game center? 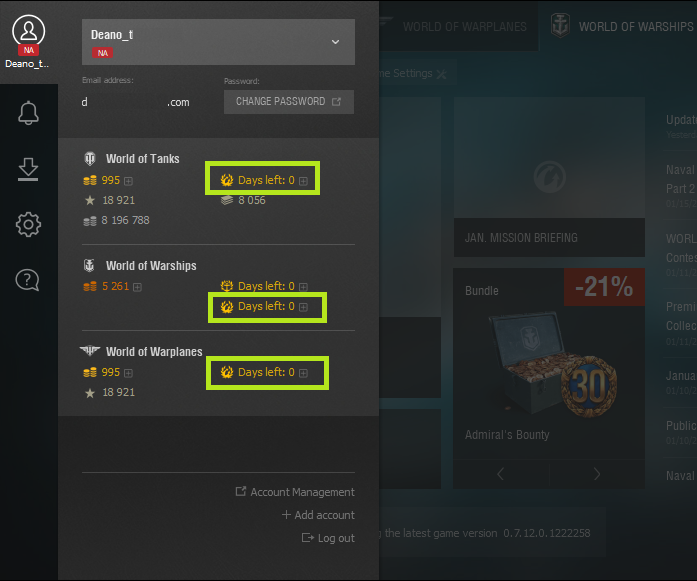 As far as I know, premium time is still shared between Tanks, Planes, and Warships even after Warships implemented a Warship exclusive premium account, with better benefits than the universal Wargaming premium account. Did you play a battle in ships since then? The battle results details, should show earned XP with Premium Time Account. Hey thanks troops for the fast response. Problem solved, seems if you win premium time for missions it plays out before you see your newly purchased Premium time displayed.